The Angriest: Star Trek: Voyager: "Learning Curve"
It is 22 May 1995 and time for the Season 1 finale of Star Trek: Voyager. Okay I exaggerate: it is no kind of finale at all. Paramount originally ordered 19 episodes for Voyager's first year (20 if you count "Caretaker" as two), however towards the end of production executives within the United Paramount Network decided to hold over the final four episodes to be aired at the beginning of Season 2. The idea was to get the jump of competing shows - Voyager could premiere Season 2 a full month before its competitors launched - but the effect was to abruptly end Season 1 here without fanfare. It is a low-key episode with visibly small ambitions. 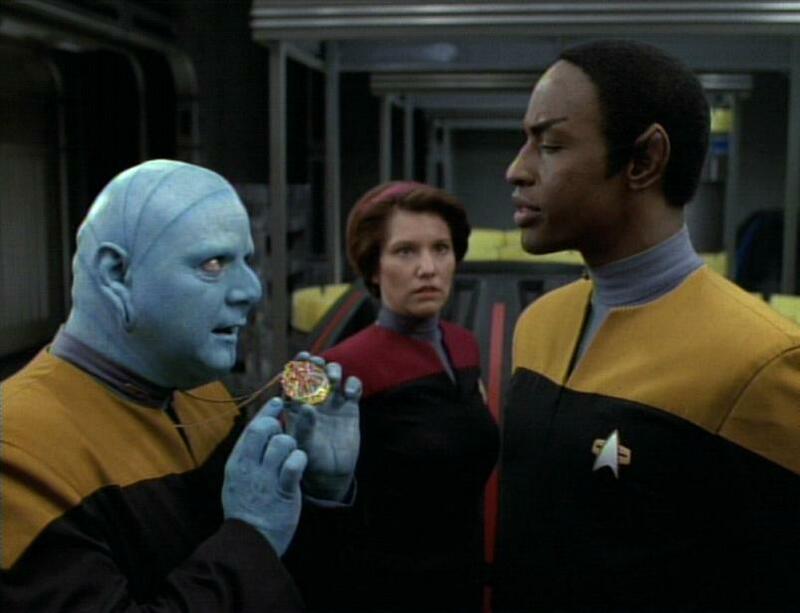 After a Maquis officer is insubordinate to Lt Tuvok (Tim Russ), Captain Janeway (Kate Mulgrew) suggests taking a small group of the less cooperative Maquis crew members and putting them through basic Starfleet training. Meanwhile the biological gel packs that provide the bulk of Voyager's processing power begin malfunctioning without explanation. I most remembered this episode for the notorious line 'take the cheese to sickbay', which is forced onto Lt Torres (Roxann Dawson) towards the episode's climax. It turns out the gel packs are failing because a bacteria-filled cheese cultivated in the ship's kitchen has infected them all. The idea of Voyager's biological circuits becoming infected by disease or the like is a genuinely clever one, but here it is by-and-large thrown away. It is a shame, because it is a much better base concept that what "Learning Curve" instead chooses as its focus. This is a stereotypical basic training storyline, with Tuvok as drill sergeant and a group of four Maquis officers as the new recruits. They all have problems, they all hate the drill sergeant, but by the end of the story you know they are going to have pulled themselves into a tight little team and developed a new appreciation for their superficially mean and uncompromising instructor. In turn he will have grown to appreciate their original thinking and creative ways of doing things. It really is 'roll your eyes' stuff. A big problem is Tuvok himself. Russ has spent the whole season - indeed he will spend the whole series - playing the logical, calm Vulcan as someone actually emotionless and rather bland. He had a difficult task ahead of him from the outset, since the only other Vulcan regular to this point was Leonard Nimoy's Spock. He is not helped in the attempt by lazy writing, and Russ simply does not seem accomplished enough an actor to develop the additional depth by himself. The Maquis trainees each fit into stereotypes. Armand Schultz plays Dalby, the hot-headed angry one. Kenny Morrison plays Gerron, the quiet and withdrawn one. Derek McGrath plays Chell, the chubby gregarious nerd, and Catherine MacNeal plays Henley, aka 'the girl'. No one embarrasses themselves performance-wise, however no one has the opportunity to actually do anything decent either. This is a weak and dull episode, with a wasted subplot and a whole pile of stereotypes and cliches. Season 1 wraps up with a whimper: there were 15 episodes in all, of which seven were good. The quality ratio finishes at an anemic 47 per cent.